(October 3, 2011; IRVINE, CA)—Spectrum Wine Auctions, a California-based auction house of fine and rare wine, realized nearly US$6 million (HK$46.5 million) at its latest live auction, held September 24 and 25 at the Grand Hyatt Hong Kong. Lively competition amongst bidders in the room, as well as worldwide via telephone and Internet, resulted in 95 percent of the lots selling. The star of the two-day auction was rare Burgundy, with Domaine de la Romanée-Conti leading in the auction’s top lot sales. A total of 80 lots of Domaine de la Romanée-Conti estimated at US$830,000 (HK$6,461,467) sold for US$1,084,821 (HK$8,445,223). A lot consisting of three magnums of 1985 Domaine de la Romanée-Conti Romanée Conti, sold for US$89,625 (HK$698,000) against a pre-sale estimate of US$50,000 (HK$390,000). Domaine de la Romanée-Conti assortment cases also proved to be a hot commodity: a 1999 assortment case sold for US$41,825 (HK$326,000) against a pre-sale estimate of US$27,500 (HK$215,000) and a 2001 assortment case sold for US$26,888 (HK$209,000) against a pre-sale estimate of US$19,000 (HK$150,000). Large formats, a highlight of the auction, also performed well. An imperial (6L) of 2005 Château Pétrus with a pre-sale estimate of US$45,000 (HK$350,000) fetched US$59,750 (HK$465,000). An imperial of 1996 Château Lafite Rothschild sold for US$19,120 (HK$149,000) against a pre-sale estimate of US$14,000 (HK$109,123), breaking the current record, according to The Wine Market Journal. A magnum of 1985 H. Jayer Richebourg, sold for US$23,900 (HK$185,225), over $10,000 more than the pre-sale estimate of US$12,000 (HK$95,000). The packed room at the Grand Hyatt saw scores of Spectrum Wine regulars, as well as a notable showing of new bidders, and many devotees who resorted to standing-room-only during the more popular sections. Bidders on the live auction floor were treated to the skillful auction style of Richard Brierley, head of fine wines at Vanquish Ltd., who kept the crowd entertained while the lots flowed. A bidders-only Champagne brunch livened the room on Sunday, with Dom Perignon and Cristal on every table, and other top-notch wines being sampled in the room including 1982 Château Cheval Blanc, 2000 Château Haut-Brion, 2002 Château Ausone, Harlan, Screaming Eagle and more. The big action was not limited to the auction room, however, as approximately one-third of the total bids were placed via Spectrum Wine Auctions’ state-of-the-art online bidding software. Video and audio from the auction were broadcast live online, enabling worldwide bidders to place their bids in real time, bidding directly against the auction floor. 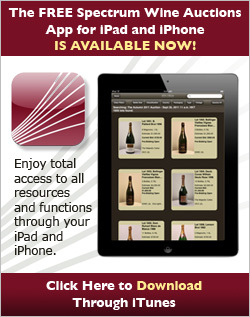 Bids were also placed on iPhone and iPad devices, via Spectrum Wine’s recently launched iOS app. Spectrum Wine Auctions is a subsidiary of Spectrum Group International, Inc. (SPGZ:PK), a consolidated global collectibles network. The company is a leading auctioneer of stamps, coins, and other memorabilia, targeting both collectors and dealers. Building a strong financial foundation, Spectrum Group International is also a merchant/dealer of certain collectibles and trader of precious metals. The company's collectibles offerings range from the modest to ultra high-end in value and span the globe. Spectrum Wine Auctions also conducts semimonthly online auctions through www.spectrumwine.com. 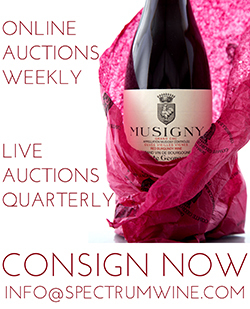 The company offers competitive incentives for consignors, including 30-day payouts in full for all lots sold regardless as to whether the firm has collected from each buyer, and the ability to consign both highly-collectible and commonly found wines. Backed by many decades of auction expertise and driven by a team of dedicated wine specialists and enthusiasts, Spectrum Wine Auctions is committed to offering buyers and sellers alike the most accessible and expansive auction opportunities of what is simply the world’s greatest consumable and collectible product—wine. For more information on Spectrum Wine Auctions, please call at 949-748-4845 or visit www.spectrumwine.com.